This is the O Page of our A to Z guide to plants -- how to care for them, landscaping with them, and cooking and healing with them. 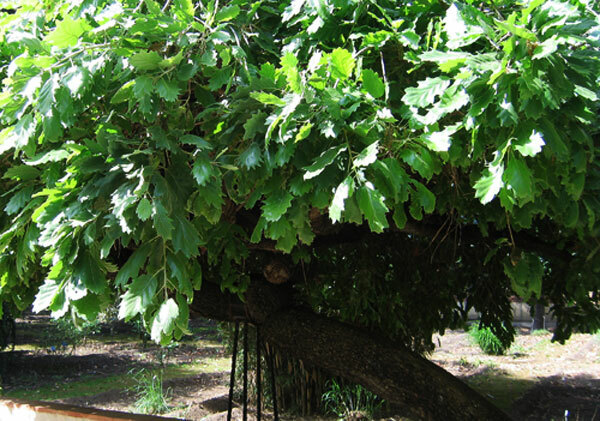 Tabor Oak, Valbnea Oak, Valonia Oak Quercus aegilops L. syn. Quercus ithaburensis subsp. 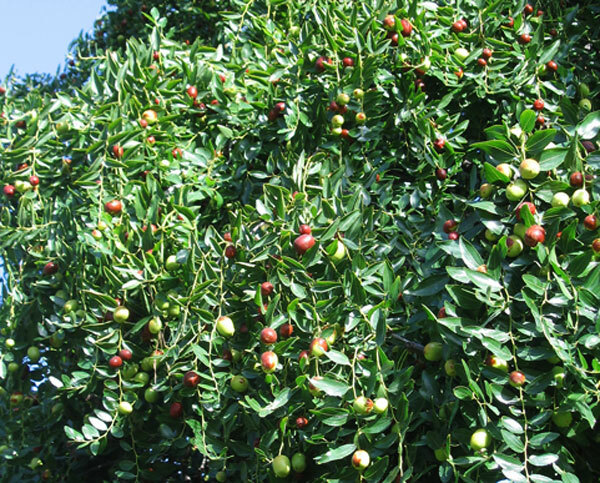 macrolepis (Kotschy) Hedge & Yalt. This is a lovely tree reminding me immediately of the huge shady oaks of my childhood in New England. Aside from the information I took from the plant label in the Botanical Garden in Palermo, I was well and truly stumped in trying to learn more about it apart from the possible synonym names above. Planting and Care: This is a tree probably best left to grow in its native places or in Botanical Gardens. The beautiful plant in the foreground of the photograph was a volunteer in our garden this spring. It took up residence in my pot of romaine and they coexisted quite well. 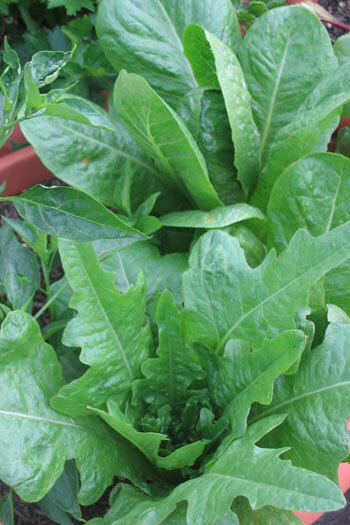 Planting and Care: Plant a pot of romaine and wait. I never ate oatmeal and I never will, but I do love homemade oatmeal bread and when a kid I loved my mother's homemade chocolate oatmeal raisin cookies. YUM! If you like oats in any form -- breakfast cereal, bread, or cookies -- that is probably not a bad thing. It is said to reduce LDL cholesterol, the bad one, to be in some way good for your heart, to be beneficial in fighting off colds and flu and to reduce your hunger at lunch if you have it for breakfast. But if, like me, you don't like oatmeal for breakfast why would you eat it? I do like oats in bread and cookies and there are lots of alternatives to oats that are also beneficial in reducing LDL. A local doctor in Guatemala suggested that soaking in a wet bath of oatmeal would reduce allergic itching. I tried it and wasn't impressed, but I have always loved oatmeal soap. Planting and Care: Oats seem to be an easy crop to plant and bring to harvest, when the real work begins in preparing them for the kitchen. They are planted in very early spring and harvested before the heat of full summer at the end of July and into August. I consider okra inedible, but the dried vegetables are beautiful and make a wonderful dried flower arrangement with just a little imagination. Planting and Care: This is an easy grower in a Caribbean environment. It seems to require little, but hot sun and sometimes water to thrive and produce prolific amounts of the vegetable okra. Unfortunately, I can't bear the slimy quality of the vegetable, but if you can, this is one of the best plants to get started with in your hot climate garden. You'll see no stars by this bush; we eradicated every one on the property as it is too known to us as a California highway bush. They are planted everywhere along major highways and roads in California because they are indestructible. Sadly, they have became popular in Montserrat for the same reasons that the California Department of Transportation chose them -- they can't be killed even by the gardeners in Montserrat! But, in truth, they just aren't that interesting and I thought we could do better. Oleanders are producers of serious allergens, so anyone with a lung disease or plant allergies will suffer dreadfully if an oleander is in the neighborhood and blooming. As well, a tea made from its leaves is a traditional abortifacient. Indeed the plant is poisonous and can cause dreadful reactions and death. When you are working with oleander, be careful to keep your hands away from your face. The sap from this plant can be very irritating to your eyes. If all of that is not enough to steer you away from planting oleander, maybe this will, "A single leaf contains enough toxins to be lethal to an infant or small child. 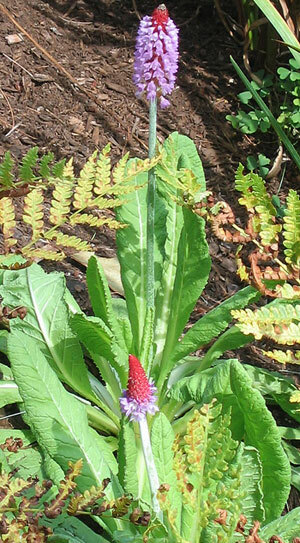 Like other poisonous plants, ingesting it first affects the digestive system with vomiting and diarrhea, then poisoning progresses into life-threatening circulatory problems. If your heart's still ticking after that trauma, oleander can also deal a fatal blow to your central nervous system, causing seizures, tremors, and coma that can lead to death." Planting and Care: You are on your own for this one. But, oleander is a popular highway planting in California where it is hot, dry and inhospitable much of the year, so you won't have any problem getting one to grow in your yard, where ever it is. These twisted centuries old looking trees need a cool winter and a long hot summer to produce the olives that are our main source of olive oil. 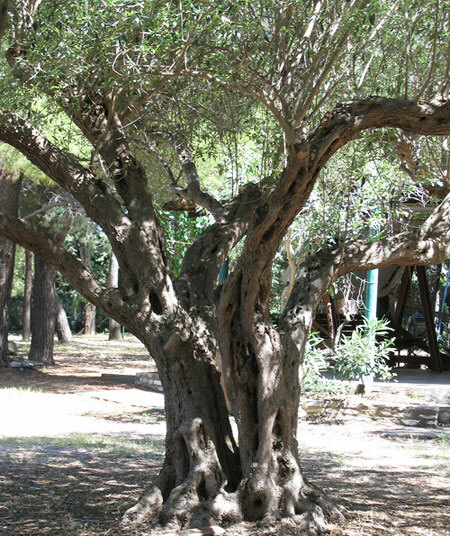 In Greece on the island of Corfu in areas away from tourism, lands in the center of the island away from the heavily visited coastal beaches, much of the dry rocky land is devoted to growing olive trees. Beside winding narrow almost maintained roads, there are groves of olives -- beautifully shaped trees appropriate to this harsh environment. Beneath the trees are black carpets of net to catch the falling fruit (along with leaves, bugs, bird feathers and bird poop). The nets are gathered up; the contents emptied into the back ends of small pick up trucks which are driven a short distance to the local oil factory where these olives become a coveted liquid -- virgin olive oil. 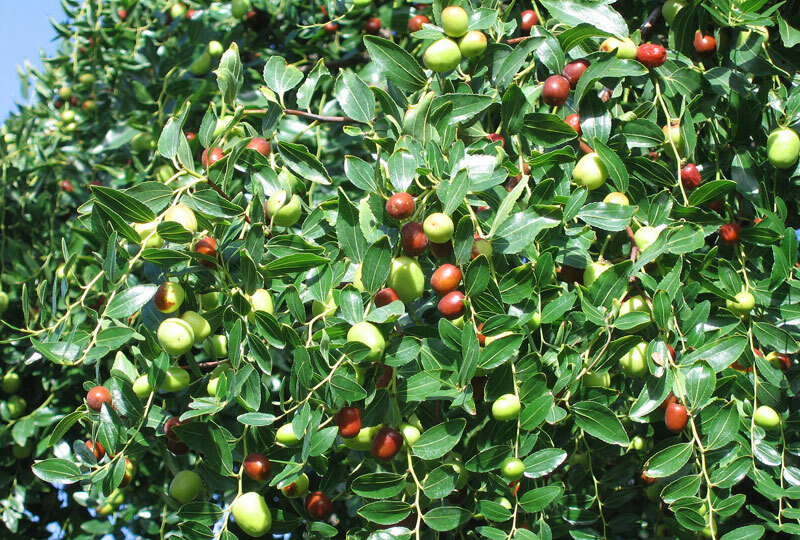 Olive oil has features that may enable it to work as a pain reliever like ibuprofen. It is also a healthy alternative to the GMO oils common in the US, corn, canola and soy. Use extra virgin on your salads if you like the taste and the lighter variety for frying as it has a relatively high burn temperature. I don't use much of anything else. 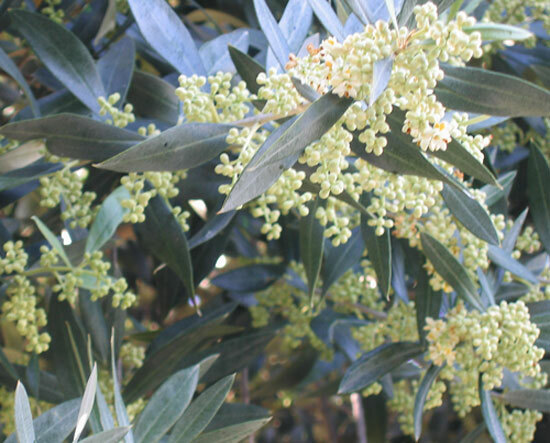 Planting and Care: I planted a package of olive tree seeds with great anticipation as my husband is Greek and lives for bread and olive oil. Although the seed packet said, "GUARANTEED TO GROW" I was disappointed at the one seedling that emerged. Still, it is surviving in my kitchen in a sunny window to keep it from the chilly winter nights here in the mountains. Every few days I give it about a half glass of water. Soon it will be repotted and returned to a sunny spot on the terrace. Even if it never bares olives it has been fun to bring home from Greece such a staple food source. To see a mom and pop, mostly pops, olive oil factory we visited in Corfu, Greece, click here. It's wonderful. Photographed: From the roadside as we traveled through Sicily in 2012. The photograph on the left is of a field of onions planted by Lake Atitlan in the highlands of Guatemala. 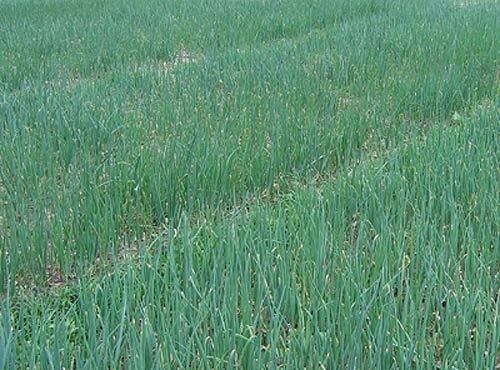 Onions are a lucrative crop there, but it is also said there is a disease risk that can ruin the entire field. Hence, they use a lot of fungicides and insecticides. On the other hand, I grew them in New England and found them an easy crop to grow organically. I had no problems with them at all and was able to successfully dry them for winter use. They do need to be stored in a cool and especially dry area. If you live by the sea probably your attic would serve better than your basement. Benefits: Let's face it, onions are just plain good for you! They don't make you stink like garlic and give you all the same benefits. What could be better than that? From: The exact place of origin of onions is not known, but they have been around a long time, even drawn in hieroglyphics in Egypt. Photographed: On Hacienda San Buenaventura land by Lake Atitlan in Guatemala. Planting and Care: First decide if you have a long enough growing season to use seed. If your growing season is shorter, consider buying onion sets which I have always used. Plant either of the options in fertile well drained soil in full sun. Try to avoid clay soils as their natural sulphur content will add to the pungency of your onions. Water them occasionally as too frequent watering can bring problems. I recently read that onions are light sensitive and will grow and then decline with the number of hours of sunlight in an average day. Toward fall before receiving a heavy frost, knock over the onion foliage and let it dry in warm sunny days. When it is thoroughly dry, pull up the onions and let them rest on dry soil for a few days. Meanwhile identify a good storage place, one that is cool, but not cold, and as free of air born moisture as possible. In New England, I used our attic and it worked out just fine. This shrub which can grow to be ten feet tall is not only a real "looker," it does its finery in tropical winters when we could all use a boost. It is a stunner as I hope you can see in the photographs. 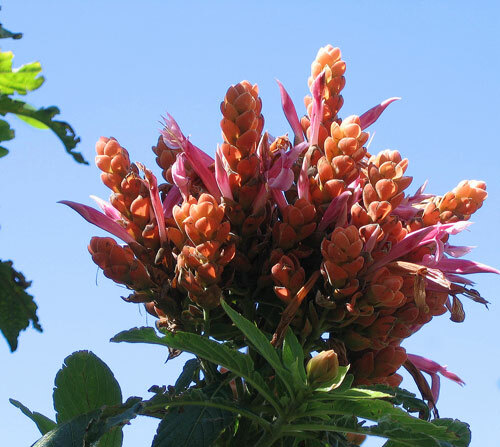 Benefits: The Aphlelandra sinclairiana attracts butterflies and hummingbirds. 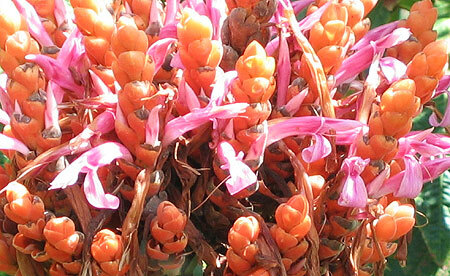 Photographed: In the Botanical Garden at the Hotel Atitlan on Lake Atitlan in Guatemala in 2010.. Planting and Care: This is another of my favorite plants as it will perform beautifully in its preferred semi shady setting in the garden. 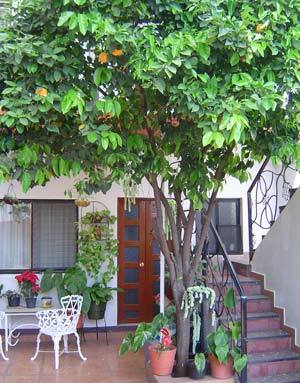 It appreciates routine watering and is happiest if the temperature doesn't fall below 50° F. though it will accommodate an occasional fall to 30° F.
Citrus trees are almost always attractive, even as this one on a patio in Oaxaca, Mexico. The oranges it produced were not wonderful, but every morning as we passed the tree, we were enlivened by the sight of fresh oranges. Benefits and Risks: Juice freshly squeezed from organic oranges is terrific. Juice from commercial oranges should probably be avoided as you can't remove the pesticides and coloring agents from the skin. As you squeeze these oranges the juice becomes contaminated and unhealthful. Juices bought in cartons in the supermarket are undesirable as are frozen juices unless they are organically produced and processed. Good luck! Photographed: In our apartment courtyard in Oaxaca, Mexico. Planting and Care: If you have a place for an orange tree in your garden, you'll probably want to purchase a tree that has been grafted to give you the strength of the base tree and the wonderful oranges of the graft. It is best to talk with your local college or university agriculture department staff about the type of tree that will have the most success in your area. Look at this beauty, a bit exotic, but doing very well in a cool climate. Though not growing quickly it is well worth the wait. At maturity it will be a foot or a foot and a half tall almost perfect for intermingling with other plants. Benefits: I have read that it is tolerant of deer, but I wouldn't bank on that too much. Planting and Care: This perennial loves a rich soil in a moist place that may be sunny in cooler climates, but probably prefers shade in warm climates. It definitely does not like to be in a place that dries out nor is it tolerant of a freezing winter. It is tolerant of soil types and pH levels. 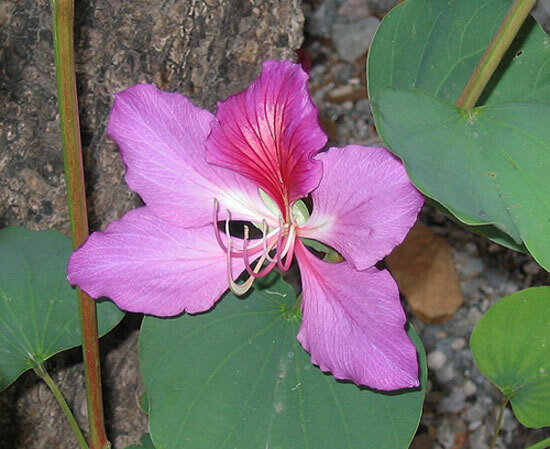 This relatively small tropical tree has lovely orchid like flowers and large light soft green butterfly shaped leaves. It is charming in the garden and requires very little care. It does have a few months of looking rather unattractive so it is best placed a little distance from your deck or patio; somewhere you will still see it in its glory, but will be able to ignore its downtime. 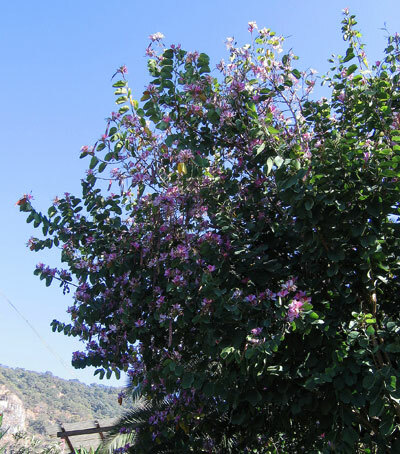 We had a white flowering one in Montserrat and later a pink one in Guatemala. 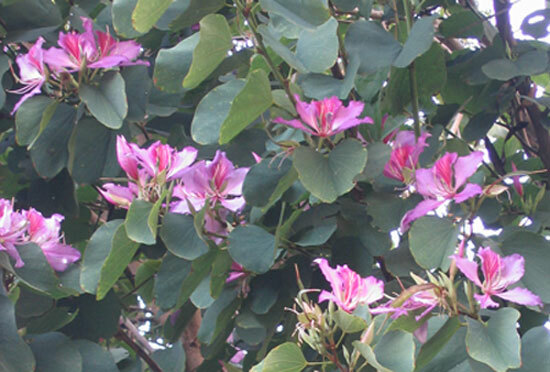 Planting and Care: Plant this small flowering tree in full sun in an acid soil with a pH less than 7.5 and it will zoom to its 25 or 30 feet of height. 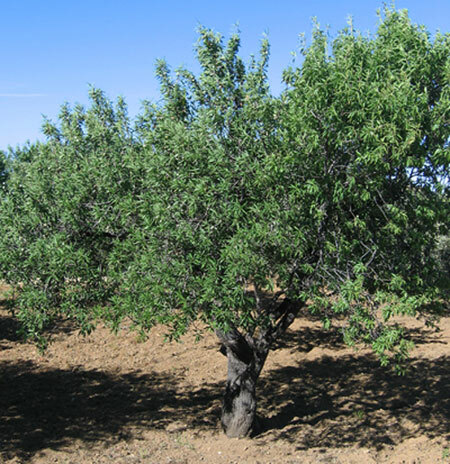 It is a fast grower and once settled in, it is a tough tree highly resistant to drought. From all I've read and from all the folks I've talked to in Taxco, Mexico, and in Tobago, oregano and marjoram are essentially the same thing. I don't really think this is true, but I don't have anyone nearby to give me an alternative. I do know that when we cook with Greek oregano it really is a different experience from cooking in Mexico with our local marjoram/oregano. Who can imagine living without a fresh sprig of oregano? Not us. We had big pot with a thriving plant in Taxco, but we gathered from the plant no seeds for our garden in Montserrat. A wonderful substitute in the Caribbean is local marjoram which tastes almost like Greek oregano. Spread liberally on a homemade pizza along with fresh basil; it's an unbeatable combination. Benefits: Oregano is said to enhance your body's ability to more effectively deal with bacterial or viral diseases. As if that weren't enough it also aids digestion and provides lots of vitamin K. Inhaling the steam from oregano tea may give you some relief from a chest cold. From: The Mediterranean. In 2007 we traveled to Greece, visiting many islands along with the mainland. Wherever we went I asked about Greek oregano seeds and was always told that the plant was essentially a weed. It grew everywhere so no one grew it in their garden and no one saved the seeds. I was very disheartened. Planting and Growth: If you have Greek oregano seeds think of them as similar to marjoram. Oregano likes a sweet soil (alkaline), full sun or semi shade and a reasonable amount of water. Oregon Grape, Mahonia, Holly Grape Mahonia sp. We found this shrub growing along side many woodsy bushes in the Naples Botanical Garden. It looked like this area of the garden was casually planted as you might find in the gardens of older homes. I think it was especially artfully done. What you are seeing in the photograph is the plant fruiting in the fall. During the summer season it has lovely bright yellow flowers. 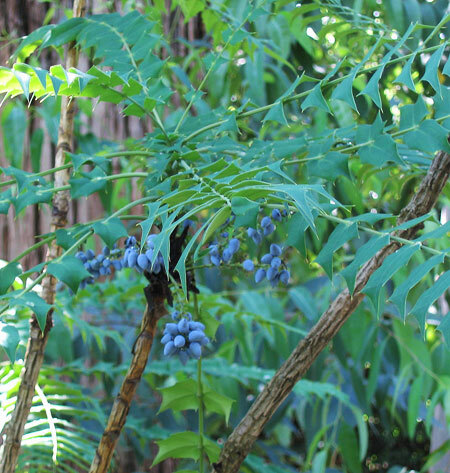 Planting and care: In a cool climate the Oregon grape or mahonia will prefer to be planted in full sun. Planted in tropical gardens it prefers partial shade. It also likes regular rainfall or watering to be at its best. Reasons for eating organic foods and raising organic produce are evident, but when the bugs get going, all too often it is easy to reach for commercial poisons. And, doesn't the idea of not ever having to weed sound wonderful? Well....here are some reasons you might want to put a little more commitment behind your choice to go organic. In the highlands of Guatemala many of the farms large and small that feed this country can be found. When we first arrived to live there in the town of Panajachel, the town market was wonderful with piles of fresh beautiful produce, eggs, chicken and meats. Vegetables that I knew were most likely to absorb and retain insecticidal poisons and fungicides I grew organically in our garden. In time, strangely shaped vegetables like bulbous cauliflower and broccoli began appearing in the market. Fresh tomatoes had unchewable skins and would last in our sunny window for weeks without rotting. I vomited violently each time I ate beautiful zucchini. Children in the small town were becoming allergic to normally common foods in the Guatemalan Indian diet. I became allergic to American peanut butter after a lifetime of its being one of my go to mom's comfort foods. Something had gone very, very wrong. I talked to everyone I could about what was going on and in the end learned that Monsanto had a large footprint in Guatemala's agriculture. I believe Monsanto was illegally doing much of their new GMO crop testing there along side of their GMO seed sales and the profitable sales of their now infamous Roundup. In time, if I didn't grow it in our garden, I wouldn't eat it. All that being said, there are many reasons to consider organic gardening techniques. Happily, organic foods have evolved in the US past the early years when in far too many cases they were extraordinarily expensive and presented for sale as slightly shriveled, bug bitten and unattractive. Now the concern is to be sure what you are buying is in fact organically produced.